Generally speaking, plants don’t like being shocked (though there are some that respond best to harsh treatment, which I’ll write about another day.) As such, you have to ease them into outdoor living gently, over the course of a week or two, so that they get used to sun, wind, rain and all the other things they’ll have to deal with outdoors. It’s incredib ly simple, if a tad inconvenient should you have a day job. Day one: Put your plants outside for two hours. Day two: Put your plants outside for four hours. Day three: Put your plants out for six hours. Day four: Put your plants outside for eight hours. Day five: Put your plants outside for ten hours. Day six: Put your plants outside for 12 hours. Day seven: Put your plants outside for 14 hours. Day eight: Put your plants outside for 16 hours. Day nine: Put your plants outside for 18 hours. Day ten: Put your plants outside for 20 hours. Day 11: Put your plants outside for 22 hours. Day 12: Introduce your plants full time to the joys of outdoor living. If you start the process but the plants don’t respond well, bring them back in and leave it for a week or so before trying again: some seed packets include details of when to harden off the seedlings, so read what the packet says if you’ve had the foresight to keep it (I keep all my seed packets in a folder so they’re easy to refer to). 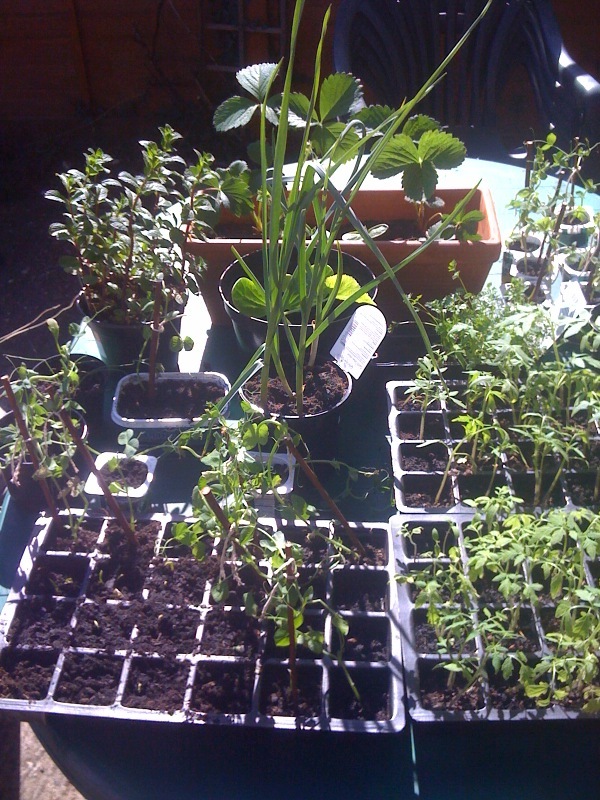 Keep your seedlings well-watered (but not overwatered) when you start the hardening off process to help give them as much strength as possible to deal with the experience of being moved outside, but gradually reduce the amount of water you give them with every passing day and don’t fertilise them until hardening off is complete to make them hardy – this is tough love. Make sure you keep your seedlings out of reach of slugs and snails so that they don’t think outdoors is full of predators (they’ll learn, given time, but why take their innocence so early?) and cover them with a net if you have seedling-hungry birds on the prowl. Overcast days are best to start hardening your plants off as they don’t put as much pressure on the seedlings who are only just getting used to this thing called weather, after a protected upbringing indoors. If you have a cold frame or greenhouse, so much the better as you can start them off in there and move them outside (in a similarly staged way) once they look strong enough. It’s as much about instinct as anything else – if a plant is unhappy it’ll show you by wilting or otherwise looking disgruntled. If you want your seedlings to grow strong, it’s a good idea to tickle them. This trick is commonly used on tomatoes but I apply it to all my seedlings. It simply entails brushing your hand lightly over the seedling tops every day, to emulate the movement they’d naturally experience outdoors through wind blowing them around. It apparently makes them stronger, and I reckon it works, so for the sake of a brief stroke every day, it’s worth a go. Plant your seedlings out on an overcast day that’s not too cold, so that they have a gentle first night outside and with any luck they’ll be happily growing in your garden in no time. If you’re worried about the frost getting your seedlings, once you’ve planted them outside, cover them with a cloche (cut a soft drink bottle in half and use the bottom half to cover the seedlings), fleece or bubble wrap at night to help keep them warm. Hardening off may sound like a faff but if you skip this step, you’ll probably lose all your seedlings and have to start again, meaning your produce will come later, so it’s essential that you put in the work. Sorry.